Terry is a gay activist, artist, writer, and 34-year survivor of HIV/AIDS. He came to San Diego 20 years ago to seek medical care at UC San Diego’s Owen Clinic for HIV/AIDS and has lived here ever since. In the fall of 2016, Terry’s landlord told him they were increasing his rent by $100 a month. As a senior relying on Section 8, this rent increase meant that Terry could no longer afford to live in the apartment and neighborhood he had called home for 13 years. “I went on the Housing Authority’s website and saw a miracle: CHW’s brand new affordable LGBT affirming senior apartments, being built 2 blocks away. For months, Terry walked by the construction site every day, taking his own pictures of its progress. and hoping he would be able to move in. He was the first person to sign up at the San Diego LGBT Center for the North Park Seniors interest list lottery, getting in line in front of the Center at 4:30 am. When he found out he was approved to move in, he cried because he was so grateful. 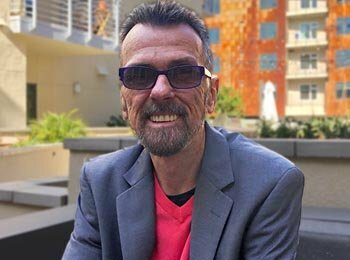 After years of isolating himself because of his orientation and HIV status, Terry decided 30 years ago that “if I came out of the closet, I would never put myself back in.” At North Park Seniors, he is free to be his truest self. With the stability of a home he can afford, Terry finally has the freedom and security he needs to write his memoir and serve as the newest board member of Being Alive, a local non-profit organization that serves the HIV/AIDS positive community.